Butterflies are often associated with transformation. These brilliantly colorful, translucent gummy butterflies can transform a so-so day into an oh-so fanciful day. Sweet, chewy candy is not an age-specific treat. Meticulously choosing one colorful piece at a time, popping it into your mouth and savoring both the flavor and the experience can brighten your mood. We all love this even more than the gummy bears 🙂 Must HAVE! Excellent soft, chewy, smooth, flavorful gummies! Best I’ve ever had, and for the price, you cannot beat them! the best gummies I’ve ever tried! 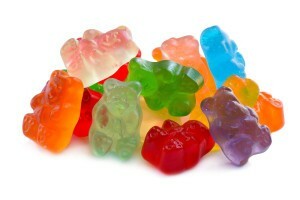 Beautiful gummy candies that taste just like the soft 12 color gummy bears that they also sell here. Delicious, and they also make for great party favors. Best gummy I ever ate and I have eaten many. Texture and flavor both done right.